Apparently, people would do anything for some adrenaline rush or to draw some attention to themselves, that`s exactly the case with this crazy BMX rider. Sure, we all did some stupid things as kids once. However, this incident right here is way out of line. In these particular cases, the kid`s parents need to step in because it`s completely unacceptable. We are really not exactly sure how come this kind of mentality can slip into the mind of a kid. In this one, you can some very disrespectful BMX riders inflicting damage on purpose. Again, we really can`t reiterate that we understand this. In some cases, kids want to be rebellious. Maybe they do this to show their individualism instead of obeying authority. However, they are completely disrespectful. They are a bunch of but BMX bikers, but one of them is the nuttiest of them all. 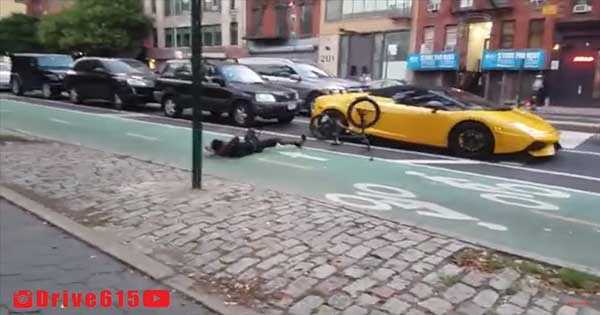 The crazy BMX rider we are talking about hops onto a parked Lambo Gallardo which looks to be vacant. He doesn`t do that once but twice! Afterwards, the other bikers decided to showcase their rebellious nature by hopping onto a parked Police car. However, there was no police officer inside the car. This goes to show what cowards these kids really are by daring to do such a thing while the person who`s the owner of that property is not in the area. That said, this cowardly action is absolutely uncalled for. We hope these kids got what they deserved and will think twice before vandalizing someone else`s property like that. Finally, what is your favorite BMX stunt? Check`em out!